The Science of Dental Materials is an applied basic science dealing with the physical, chemical and biological properties of the materials used in clinical dentistry and their interaction with other tissues. An understanding of these properties as well as their handling is critical to the selection of dental materials in the field of dentistry. The Department of Dental Materials includes a team of experienced and dedicated teachers. It also has a well-equipped laboratory where students can develop basic practical skills and get acquainted with commonly used dental materials. 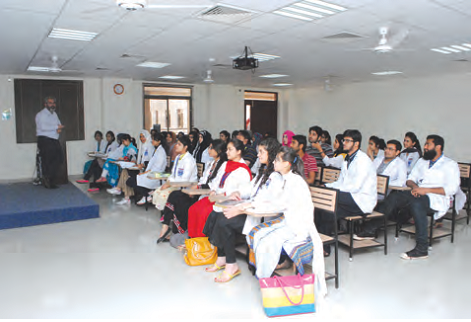 To meet the contemporary education standards and facilitate knowledge at a professional level, the department acquires various teaching strategies such as lectures on multimedia, video demonstration, tutorials, practical’s and routine assessment tests. The Science of Dental Materials is a basic science subject of First professional BDS. It entails the study of mechanical, physical, biological and chemical properties of materials used in dentistry with emphasis on material in correlation with both clinical and non-clinical aspects. It involves study of composition , manipulative techniques, applications of dental materials and the way in which they interact with the oral environment in which they are placed. The subject provides an insight of dental materials that are currently used in dental materials that are currently used in clinical dentistry and covers the underlying principles of their functional properties, bioactivity and biocompatibility. Department of Science of Dental Materials provides both the scientific background and the practical skills needed by students to make the best useof new and available materials. The course begins with an introduction to the major classes of materials used in dentistry including polymers, metals and ceramics and restorative materials with their properties, manipulation, chemistry, testing methods and placement. A fully equipped Dental Materials Laboratory has been established with enough working stations for the students to diligently perform their practical work. The laboratory area includes Plaster room, Curing room and Dental museums.